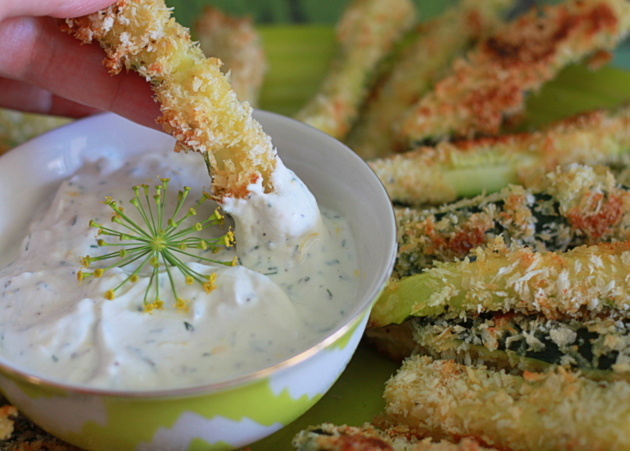 Crispy, spicy Panko-coated zucchini fries dipped in a cool Greek yogurt dill dip. Yum. 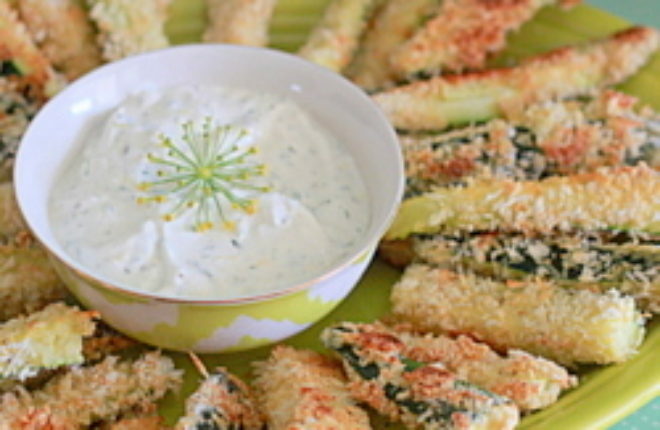 So, zucchini fries. Not a new concept in the blogosphere and beyond, but something that flew under my radar until only recently. When I caught a glimpse of these crispy goodies during one of my many massive pinning sessions (ahem, can you say “Pinterest addiction”? ), I knew they had to be mine. Zucchini. Cut into fry shapes. Breaded in spicy Panko bread crumbs. Baked until crispy. Dipped in a cool, lemony, dill-infused Greek yogurt dip. I’m pointing at my belly. 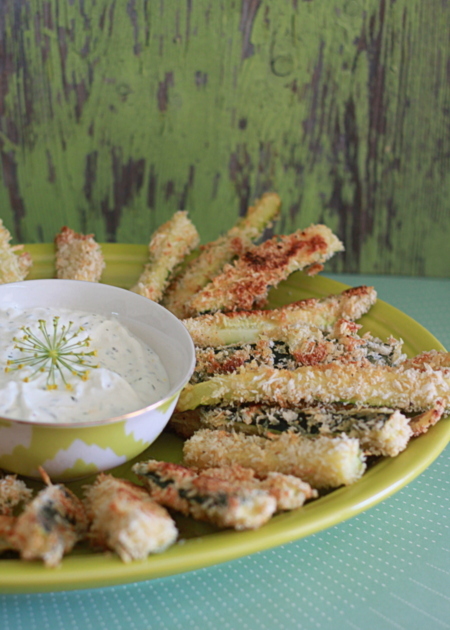 Get in there, zucchini fries. Just want the fries but notsomuch the dip? These are also great dipped in ranch, and though I’ve not tried it personally, I’ve seen lots of folks go the marinara route, and that looks darn good too. In a small bowl, blend together the yogurt, garlic, dill, lemon zest, lemon juice, salt, and pepper. Cover and refrigerate for at least an hour to allow the flavors to meld. Heat oven to 425 degrees Fahrenheit. Line a baking sheet with parchment paper or a silicone mat. Prepare your ingredients: Place flour in a large Ziploc bag. Crack eggs into a shallow dish and whisk along with 2 tablespoons water. Mix Panko breadcrumbs, salt, pepper, garlic powder, and cayenne pepper in a shallow dish. Add zucchini to the Ziploc bag with flour and shake gently until all pieces are covered. 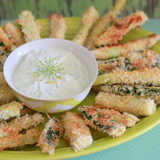 Working with three or four sticks at a time, dip the zucchini sticks in the egg mixture then place in the Panko mixture, turning to coat. Gently lay on the baking sheet. Repeat, mixing the Panko breadcrumbs often to keep spices distributed, until all pieces are coated. Evenly drizzle olive oil on top of fries. Bake for 15 - 20 minutes until all sides are golden brown. These fries look so delicious! The dipping sauce sounds perfect.